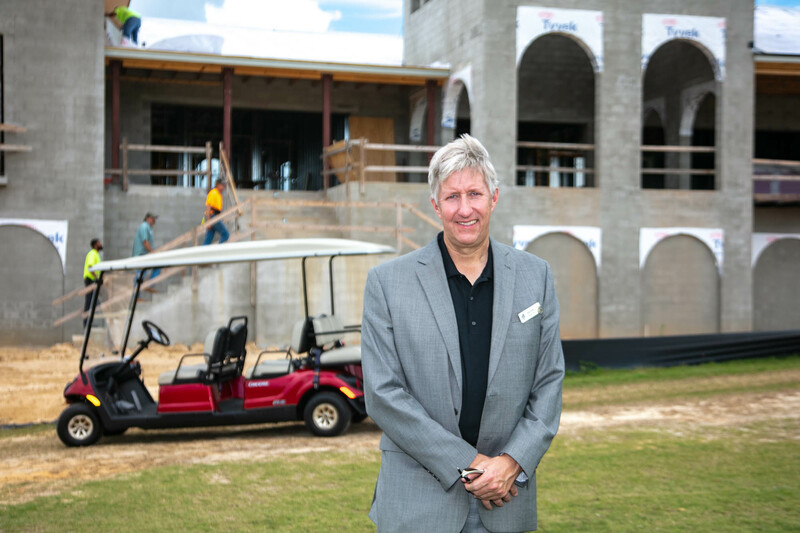 Leading up to Memorial Day Weekend, we were very pleased to meet at the new Clubhouse construction site with Reunion’s General Manager; Kevin Baker. Many regular visitors to Reunion will recognize Kevin’s face and name through his role as Director of Golf at the resort. Anyone that has had the pleasure to golf at Reunion will indeed appreciate the sterling work that Kevin and his staff have constantly provided. So it’s not surprising that Kevin has been provided the top position as General Manager of Central Florida’s most prestigious golf community. This weekend marked the 100th day as General Manager and what better way for a golf professional to debut than with a stunning new clubhouse. With over 7,500 sqft of accessible amenity space, members, resort guests and any vacation rental home visitor may enjoy this beautiful new resort amenity, complete with grandstand views of the Nicklaus course 18th green. My description of features does not do the new clubhouse any justice at all. The style and ambiance is said by Kevin Baker to be stylish, inviting and relaxing, with a nod to the great Jack Nicklaus himself and a warm welcome to Reunion’s many hundreds of members. Expected to be open for 3 meals, from 7am through 9pm, Reunion’s Legends Corner area finally receives the 5 star treatment that members and resort guests truly deserve. The Clubhouse will be open towards the end of 2018 and we can’t wait to hang out there!